Here is a very important tool for boat control. It allows me to fish in wind blown areas where I couldn't with out it. 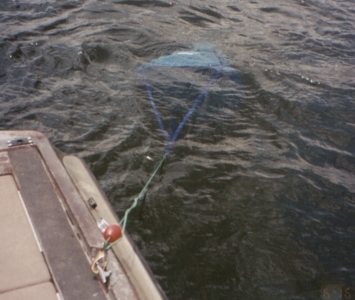 It is also very important in slowing the boat down in the fall while sucker fishing. Notice how it is attached to the boat with a rust proof clip. I, also, installed a float on the line so that I can disconnect the sock if I need to while fighting a fish and go back and pick it up afterwards. The float will also ensure I won't loose it if it would fall overboard if it's not hooked up. I store the sock in a mesh divers bag so any moisture can escape when stowed. I have thought about buying a second one to place on the other end of the boat in strong winds.